Robert Kraft (center), Bill Swanson (right), and Matthew Slater (left) listen to a group from the Nashua Boys & Girls Club at the "Science of Sports" event at Gillette Stadium on Saturday, May 31, 2014. For months, students affiliated with Boys & Girls Clubs around Massachusetts have worked with Raytheon employees on sports-themed math and science projects. On Sunday they presented their work to the sixth annual “Science of Sports” fair at Gillette Stadium. 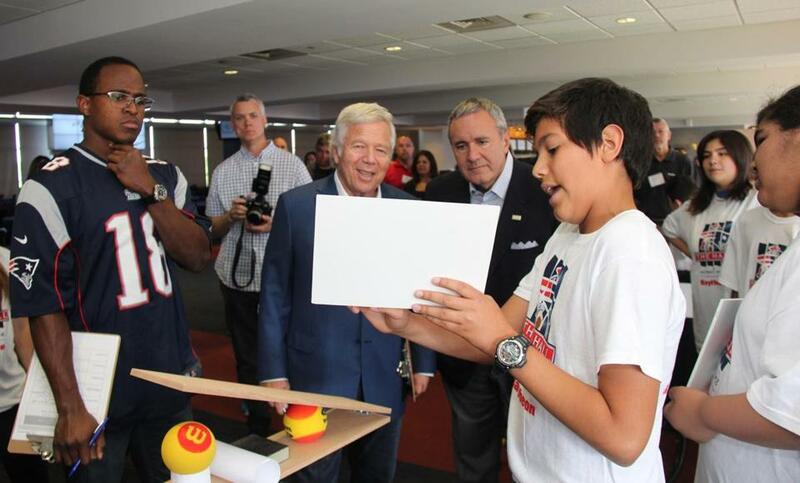 The day’s judges were Pats owner Robert Kraft, Patriot Matthew Slater, and Raytheon’s Bill Swanson. The big prize went to the Leominster Boys & Girls Club, which won $1,000 scholarships for each member of the team. . . . Eric Dane, of “Grey’s Anatomy” — who’s in town to film the movie “The Grey Lady” — was spotted at Uni Sashimi Bar on Thursday night. “Top Chef” judge Tom Colicchio, who’s in town to film the 12th season of the show, dined at Uni on Friday.